Mackeymedia.com "Brings you closer to the people that shape The Bahamas creative landscape & culture." Live entertainment is returning to Grand Bahama thanks to the energetic efforts of Joe Fox and The GBEMAA - Joe Fox, President of the Grand Bahama Entertainers and Muscians Association, stopped in to Mackeymedia for an interview with his long time music industry comrade and friend, Dave Mackey to discuss the GBEMAA, his early days as a musician in the Bahamas and his 30 years as an Entertainer and entertainment director in Las Vegas. A lot of fascinating history is discussed here including the 1977 T-Connection concert at the Goombay Park adjacent to the International Bazaar, Freeport where his band Fox Fire was the opening act. The MC for the show was none other than our Minister Of Tourism, Hon. Obie Wilchombe! Click the play button below to join this rollercoaster ride through the entertainment life of Joe Fox, a man never short for words or enthusiasm. We are quite excited about our new partnership with Robbin Whachell to provide a home base for her newsletter content which, at the same time, building on the initial foundation of gbweekly.com. For glimpse back at the pre-Y2k days during 1999 click here to visit the gbweekly.com archives. There you will see and hear a number of persons who have since left this life. The re-activation of these archives has been done in their honor. Enjoy the content and enjoy the new gbweekly.com Click on the play button below to hear our interview and get to meet Robbin Whachell. To be added to Robbin's gbweekly newsletter email: robbin@coralwave.com. Grand Bahama based Real Estate Firm goes Global - With great enthusiasm, James Sarles, CEO of Coldwell Banker James Sarles Realty explains the reasons for his March 1st 2006 alignment with the international real estate firm Coldwell Banker. A major point made by Mr. Sales during this enlightening interview is that as part of the Coldwell Banker franchise, no longer will the pool of potential investors be limited to tourists who just happen to find Grand Bahama on vacation, but that now through Coldwell Banker, JSR has the resources to actively pursue high end clients through advertisements in exclusive magazines and financial newspapers etc. In just five short years James Sarles Realty has graduated from the "New Kid on the block" with just two employees; himself and Catherine MacLeay, to Grand Bahama's leading household name in real estate. Now as Coldwell Banker James Sarles Realty, James, in this streaming audio interview, reveals how his company has moved to the next level. 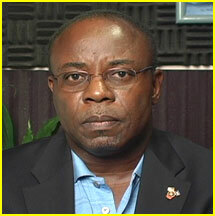 This interview contains information of great value to international and Bahamian investors. Simply put, the Coldwell Banker James Sarles Realty franchise provides:"Local expertise with true International reach. Click on the play button below to hear the interview. To visit their web site www.sarlesrealty.com click here. Publisher David Johnson of the popular Bahamian monthly newspaper "Happenings Around Town" discuses the remarkable growth of his publication from a circulation of 10,000 per issue to 50,000 during its 12 year life span. Mr. Johnson says that "Happenings Around Town began as a marriage between businesses in Florida and businesses in the Bahamas describing it as a long and winding but exciting journey. The publication is available at numerous depots on Grand Bahama and at various marinas and hotels in South Florida. Happenings covers any and all events that have a positive impact on The Bahamas and tourism, it is especially an excellent guide for tourists on where to find great restaurants, hotels and activities. Often times discount coupons can be found inside. Email them at: happenings@broadband.bs. Press the play button below to meet David Johnson and delve into his informative publication "Happenings Around Town "through Mackeymedia's audio streaming interview, enjoy! In celebration of The Grand Bahama Port Authority's 50th anniversary, Mackeymedia was contracted to produce a DVD on the Founder of Freeport, Mr. Wallace Groves. This DVD was on an endless loop that played at the Sir Charles Hayward Library for several months. Click on Mr. Groves picture to view a short compressed excerpt of "The Man who launched a legend." The executive producer of this documentary is Mr. Barry Malcolm Executive Vice President of The Grand Bahama Port Authority. 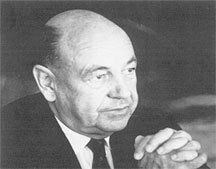 The concept was developed by Mr. Peter Barratte a former GB Port Authority executive that worked under Mr. Groves. This DVD contains numerous historical pictures of Grand Bahama and the people that have contributed towards making Freeport into the great city that it is today. In this DVD production, the early history of Freeport is encapsulated in Wallace Groves own words. Tribune Newspaper reporter Ms. Denise Maycock plays the part of a reporter interviewing Mr. Wallace Groves in a re-enactment of an interview that was originally conducted by the Bahamas Handbook. Wallace Groves is played by successful U.S. Businessman Mr. Mike Kelly, the voice Wallace Groves is that of Mr. Larry Nelson from Dolly Madison Home Center in Freeport GBI. The documentary was created and directed by Dave Mackey. The video included here is a compressed excerpt of the production. Mackeymedia went on the road to the home of Marina Gottlieb Sarles the author of the best selling book “Sand In My Shoes”. Marina, a multi-talented and deeply spiritual person, shares her passion for writing and provides insight into her new novel now in progress under the tentative title “City Of Horses.” This interview commences with Marina, also a dynamic female lead vocalist, ad-libbing the lyrics of her original musical composition entitled “Out on The Streets,” a song that tells her life story. It was the first song ever recorded in her brother, The Late Cay W. Gottlieb’s recording studio Cicada Sounds. The song was engineered, arranged and produced by Dave Mackey. Marina also provides a synopsis of her first book “Sand In My Shoes.” Her new book “City Of Horses” is set during the time of World War II in East Prussia, the birth place of her mother the late Owanta Gottlieb Von Sanden , author of the book “Angel Stand By Me” (translated from German to English by Marina). The name “City of Horses” is inspired by East Prussia’s passion for raising the Trakehner , the most noble of Thoroughbred horses. It was a place where stallions lived like kings until Prussia was invaded by the Russians who killed all but 25 of 1400 stallions at the farm were Marina's story is set. Marina’s Story is about a very famous stallion stud who was mowed down in cold blood. Marina’s family arrived on Grand Bahama through Mr. Wallace Groves the founder of Freeport, her Father, affectionately known as “Doc” (Dr. Gottlieb) was hired as a doctor for the workers of The Pine Ridge Lumber Yard. Press the play button below to hear Marina's adventurous thought provoking Interview. Prolific Bahamian hit song writer Kirk Bodie (KB) interviewed at Mackeymedia takes us into his humorous world of Bahamian Folklore in song. Well loved by Bahamian and Caribbean audiences, KB is more than ready for the world. In this fun filled interview with Dave Mackey, listeners will also learn of KBs early beginnings performing in Boston, Rhode Island, New York, Connecticut and Nassau. KB also discusses his recent travels around the world with The Bahamas Ministry Of Tourism. As an added bonus, this interview explores the inspiration behind some of KBs numerous number one hit songs: "Just Cause She Fat", "The Stroke Man", "All de Meat", "Civil Servants", "Play by Myself", "Biggest Box in the World", "She want a Thug", "The Coo Coo Soup" and more. KB sheds light on his soon to be released song: "Calling all Crabs", and he explains the ancient indigenous practice of catching crabs (a delicacy, especially when cooked in rice or boiled with dough and cassava). Audio samples of KBs music will be uploaded for your enjoyment shortly. Email him at: strokeman23@hotmail.com Click on the Play button below to hear this entertaining interview with KB, a true island boy. Popular Grand Bahamian personality known for his original indigenous style of preparing Conch Salad & Grilled Conch, Tony Macaroni Interviewed at Mackeymedia. Tony Macaroni's Conch Experience has been in operation on Taino Beach (now Known as Edward St. George Memorial Park) for more than 10 years. Tony's gregarious personality attracts locals on a regular basis and tourists return to visit him and enjoy his delectable Conch recipes, play volleyball, hang out on the beach and socialize every trip. In this informative interview with Mackeymedia web master Dave Mackey, Tony articulates a wealth of information not only on himself and his preparation of the popular aphrodisiac, Conch, Tony also provides interesting facts about Grand Bahama. Tony's talents are so respected that The Bahamas Ministry Of Tourism invited him to prepare his Conch dishes at The Smithsonian for a special international cultural event that attracted millions. Click on the Play button below to enjoy this informative interview with Tony Macaroni (affectionately known as "Zips" by those of us who have known Tony for the last 20 plus years). Click on Tony's Picture to view images taken at "Tony Macaroni's Conch Experience", a place that everyone visits on Grand Bahama Island. Creative Bahamian Artist Chantal Bethel interviewed at Mackeymedia gives us a glimpse into her creative world. 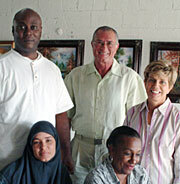 From Haiti to Belgium to The Bahamas Chantal's cultural diversity is naturally expressed in her paintings. Often times Chantal's paintings evoke deep emotional reactions from visitors to her exhibits. Be sure and visit her website www.chantalbethel.com to view her collection of fine Carribbean, Bahamian emotional art that is inspired by life. Press the Play button below to enjoy this adventurous interview with Chantal, a well loved and admired Bahamian Artist. Mackeymedia.com proudly presents a streaming video interview with Dr. Doswell Coakley President of The Grand Bahama Chamber of Commerce. Dr. Coakley explains what the chamber is, what it does, how to join, present on-going projects, Friends of The Chamber and he elaborates on the highlights of his tenure as head of the this prestigious organization. This is part 1 of an ongoing series. Click on his image or HERE to view his enlightening streaming video content Enjoy! Bahamian Gospel artist Verdant Scott opens a new chapter in his contribution to the Bahamian gospel music industry as a producer of church choirs. The album "Here in Zion" produced jointly by Verdant Scott and Steve Colebrooke has inspired many lovers of gospel music in the Bahamas. The Album features the Zion Baptist Church choir in Freeport. In this streaming audio interview, Verdant discusses the exhilaration he experienced producing this album for his church headed by Rev. Peter Pinder and he reflects on his history as a Gospel artist from his humble beginnings on Andros island to his days as a member of the Highway Harmoneers to the present. We present here not only his interview, but also, a streaming audio sample of the production work by Verdant Scott & Steve Colebrooke of the Zion Baptist Choir. To see the album cover click here or on Verdant's picture. The Bahamas Bermuda connection- Through the collaborative efforts of Tango Multimedia, Bermuda and Mackeymedia, Bahamas a new jingle for the Bermuda Yellow Pages has been created. The Executive Producer of this new jingle conceived by Tango Multimedia was Donna Tiffin, it was produced, arranged & engineered by Dave Mackey at Mackeymedia Freeport with aid of Dave (Shakey) Coakley on Drums & percussion. Shakey, is one of the brothers of T-Coakley, former band leader of the Grammy nominated band, T-Connection. Thanks to computers and internet technology, collaboration and communications between Bermuda and The Bahamas was a snap. The final product was FTP uploaded to a private user area on Mackeymedia's server without a single package ever having to be mailed! Organizations interested in having a jingle composed or radio adverts produced by Mackeymedia can click here to visit mackeymedia.com jingle creation links page to hear productions samples and to fill out our on-line Jingle Production Form. Mackeymedia is pleased to present the opportunity for the world to meet six of the members of the Grand Bahama Artists Association through our streaming video technology. Click on the image at the left to meet artists Sheldon Saint, Terry Lord Rolle, VP GBAA, Leslie Duncombe (owner of Freeport Art Center), Angelica Siska, Nicole Angelica & Rupert Watkins President GBAA as they enlighten us on their inspirations, aspirations and backgrounds. Congratulations goes out to the association on the tremendous success of their 10th annual Art Show held March 2nd - 11th 2006 at the Freeport Art Centre. The association started in 1996 as the Paradise Artists Association and ten years later the Grand Bahama Art Association is the second largest art community in our country. Much has been accomplished in their short history. With a small membership, the first executive of Leslie Duncombe, Michael Rolle and Terry Lord Rolle began a journey to promote art and artists on Grand Bahama Island. From their very first show at the Ruby Swiss, the Association held art shows and exhibitions in all the hot spots on the island. Today the Grand Bahama Art Association, a non profit organization, continues to facilitate artists’ development on the island and to assist in establishing an appreciation of the arts through art exhibitions and workshops. Duncombe, Rolle and Lord Rolle have been joined by many new member artists to present works of art to the community. In the photo above is the 2006 GBAA executive body, from left to right Rupert Watkins, President GBAA, John Manley Treasurer, Del Foxton Public Relations sitting left to right; Alisa Streathers-Robinson and Terry Lord Rolle VP GBAA. Bahamian musician Dave Hoyte, well known for his dynamic Steel Drum performances stops into Mackeymedia to record an interview for the web. Dave Hoyte aka "King David" is the artist that released the popular album "New Wave Steel Pan" produced by Dave Mackey at the late Cay W. Gottlieb's Cicada Sounds Studio. 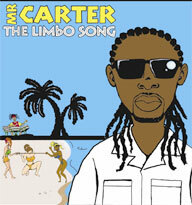 Dave plays numerous musical instruments and has arranged music for a wide variety of popular Bahamian musicians. He presently offers pre-production services for songwriters and recording artists and can be seen on-island performing at different functions and special events. He is also available for live performance bookings. King David is the son of the late Leslie (Little Sparrow) Hoyte and is the brother of Mike Hoyte. More information on this connection can be cross referenced on this site in our audio interviews archives museum Click on the play button below to hear his story. Enjoy! Dolly Madison Home Center, Whirlpool, Dixie Bedding, Tropical Shipping & Borco teamed up to donate 100 Whirlpool Refrigerators & 2 large trailer loads of bedding to affected Hurricane Wilma victims. Mr. Don Roberts President of Dolly Madison Home Center said: " Basil Christie of The Archdiocesan Hurricane Preparedness and Relief Committee came along just in time with a well-organized distribution plan that assured us that those with the greatest needs would be the first recipients of the goods supplied. We contacted Whirlpool & King coil Mattresses in the U.S. and Tropical Shipping here in Freeport to construct a plan of action whereby the Refrigerators from Whirlpool and the bedding from Dixie Bedding could arrive on island basically at cost thanks to the financial assistance of BORCO. Mr. Roberts went on further to say "I am also pleased to announce that we are presently in talks with Rooms To Go and good news is forthcoming with regards to further contributions. " Click on the picture above to view the streaming video content. Enjoy! Digitally restored - Streaming Video from the never before seen pilot TV version of Bahamian Slam Jam! Many familiar Bahamian faces will be seen in this short excerpt compiled between 1993 and 1994, you might even see yourself!. "Bahamian Slam Jam" was a popular independent radio program from the late 80's and early 90's co-hosted by the late Cay Gottlieb and David Mackey A.K.A. Inspector Smoik. 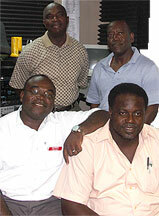 BSJ was a humorous satirical radio program geared towards promoting Bahamian Music and culture, it aired on ZNS3, Power 104.5, WVCG & WAVS in South Florida. The show featured Cay Gottlieb, a Lawyer by profession (a natural born comedian) as the Funny Man & Dave Mackey as the straight guy . Click on the picture of The Late Cay W. Gottlieb (1946 - 1997) to view a the video. Click Here to view still screen captures (photographs). Cottages by the sea perched on a hilltop, overlooking Moss Town Creek, On Exuma Island in an uncrowded, unspoiled, natural environment. Mackeymedia web master Dave Mackey presents here for the first time two instrumental tracks from his unreleased solo album entitled "Adventures in Music". The first track "Spiritual Journey", an emotional song by the sea, combines a classical selection from Anna Magdalena Bach's notebook with original music composed by Dave Mackey, former lead guitarist for Capitol Records recording artist T- Connection. Special thanks and praises to Kurt Heinecke for the dynamic Fugal Horn (I believe that Kurt is one of the composers for the "Veggie Tales" music) accompanying Dave Mackey's acoustic guitar work on this track. All other instrumentation on both songs were arranged and performed by Dave. The second composition, "Adventures in Music" is a unique blend of Bahamian Junkanoo rhythms layered with original music by Dave and Classical melodies by Mozart, J.S.Bach Beethoven and other influential classical music monoliths. It is hoped by mackeymedia.com web master that one or more of the songs included on the "Adventures in Music" album would be utilized as a film score. All tracks are copyrighted, if there is any interest or comments email: promotions@mackeymedia.com or click on the contact link above. Press the play button above, it works like a CD player. Streaming takes aprox.15 - 30 seconds to play depending on your connection speed. Both recordings will be mastered shortly. Other compositions will be uploaded in the near future. Enjoy! Zhivargo Laing - Author motivational speaker, former government cabinet minister. 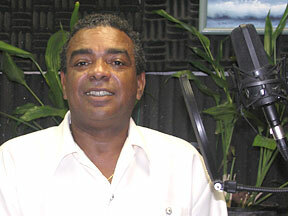 Swain Armbrister - Deceased Secular recording artist turned gospel final recorded interview. includes a song. Dr. Kenneth Dickie - Talks about his plastic surgery practice and his plans for a "Wellness & Anti-Aging Center center" soon to be constructed. Donald McCartney - Deputy High Commissioner to the Dominion of Canada. Mackeymedia presents a streaming audio interview with long time friend and business associate Janet Albury president of VIP Services. Among the numerous marketing & special events planning services provided by VIP, they now offer wedding planning and training certification for interested entrepreneurial individuals. Janet, a "Weddings beautiful Worldwide" certified wedding planner has purchased the rights to sell these courses in the Bahamas and throughout the Caribbean. In this audio interview She discusses the procedures involved in getting married in the Bahamas. Press the play button below to hear this interview. For more information visit www.andthetwobecameone.com. Mackeymedia's streaming audio interviews are compressed utilizing advanced high quality algorithms that guarantee instantaneous download at great fidelity. Simply press the play button and hear the audio INSTANTLY just like on radio! been answered. Mackeymedia.com presents to the world never before seen pictures from the T-Connection scrapbook. Click on the group picture to view them. Pictured (L-R) Kirkwood Coakley: Bass & Drums, T Coakley: Band Leader, Keyboards & Vocals, Dave Mackey: Lead & Rhythm Guitars (Mackeymedia.com webmaster) & Tony (Monks) Flowers : Percussion & Drums. Note: T-Coakley also plays acoustic guitar as heard on "Paradise", "The Best Of My love" and more. T-Connection was nominated for a Grammy for their hit "Do What You Want To Do". They appeared on numerous T. V. programs including American Band Stand, Top Of The Pops & Soul Train. For more pictures be sure and utilize our Search option above. Enjoy!